Most of our clients make 50% or more of the revenue from repeat customers. 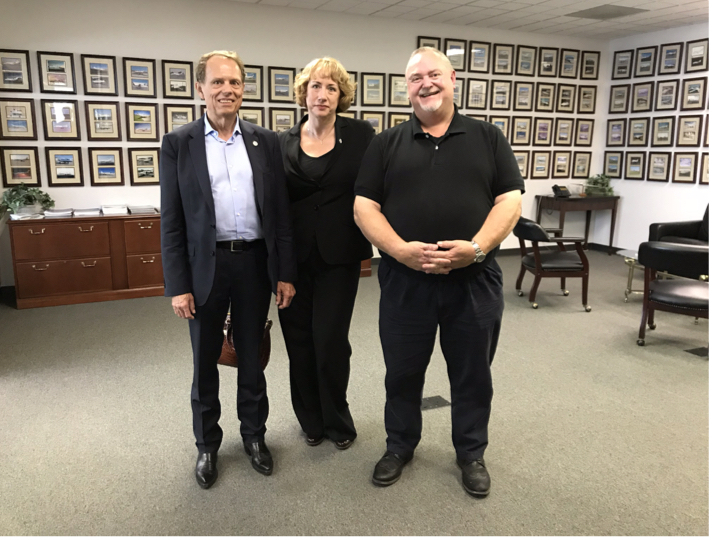 Aviation is interesting that way – the high trust, highly regulated, b2b nature of most sales in the industry, once you get PAST that trust barrier and become a trusted partner or vendor, customers tend to be very, very loyal. Of course, every sword has two edges- once you gain a happy customer, inertia is on your side. But that doesn’t mean it happens by accident, or can be taken for granted. In this episode, we talk about three ways to maximize the return on investment from your CURRENT client list. 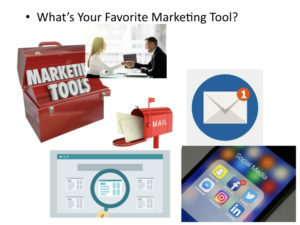 Use your (and their) favorite marketing tools to tie into your customers’ needs when they need you! Some of our clients sell consumables or software, which their customers buy each month. We also have clients who are aircraft brokers or airport construction-related companies, that may not have an obvious resale pattern. People don’t buy a new business jet or a new hangar every year! But if you watch the market long enough or see enough data about your specialty, you’ll probably find that many flight departments upgrade some of their aircraft every three or four years. And every airport tends to have new building projects going on once every five or six years. 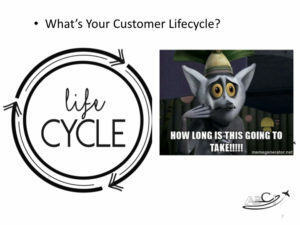 Most of our clients have a customer lifecycle (or the length of time that goes by between purchases) somewhere between every month and every four years. Just like a great waiter knows exactly when to come by and ask for your order, you can magically pop up in your customer’s attention just as he is coming to the conclusion that he needs to contact you again. If you know, from your experience with them or from industry data, when they’re most likely to buy again, you can make an effort to reconnect with them, just at the time they need you. Where we live, a company called Jiffy Lube sells oil changes and other automobile services, and they manage this better than anyone we know. They write down the odometer reading each time you bring you car in, and they know the manufacturer’s recommendations for your make and model of automobile. So they send a convenient postcard (with a coupon, of course!) reminding you that the manufacturer for YOUR car recommends service for this specific number of miles and this specific date range, so here’s $20 off your next service! And here’s a number you can call for priority scheduling. It’s brilliant. And yet I have seen VERY few aviation companies do something similar. So, how do you reach out them? Ideally, you’ll know how you connected with this particular customer in the first place, and have a feel for his or her favorite mode of communication. In any case, things change, and people are busy. So it’s best to use at least two different media, and usually at least two separate attempts. The Offer: A free service (or an extended warrantee, or a pie, or a set of golf clubs) when they make a purchase before a deadline. Make sure you remove people from this campaign if they respond, so you’re not driving your best customers crazy! Remember that “yes,” “no,” or “not at this time” are all valid responses! A great Customer Relationship Management system (CRM) like Hubspot, SharpSpring, SalesForce or Infusionsoft makes all of this MUCH easier. 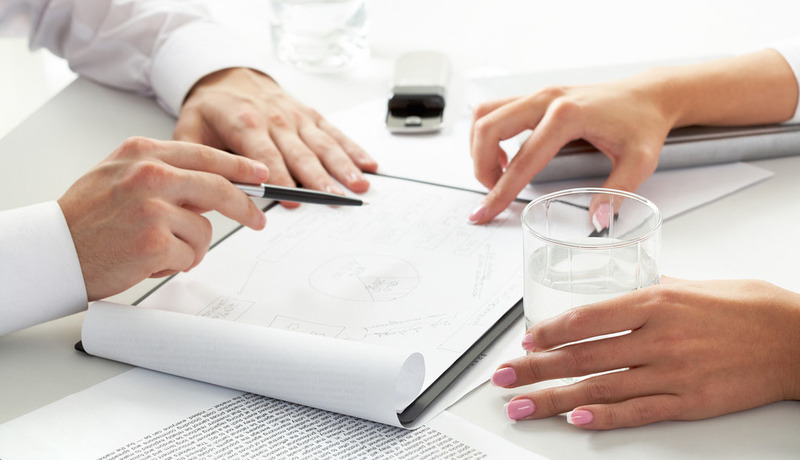 Your CRM can run reports to help determine who to include in this campaign. It can help you determine which media that have been getting the best response from a particular customer or set of customers. It can also send emails, print postcard labels, send texts, and remind your sales staff to make calls and documenting the results of those calls. Your CRM will also make it easier to remove people from the campaign as they respond. If you don’t have a CRM, or don’t know how to use it to accomplish these particular tasks, some companies or professionals do it using a spreadsheet, index cards or a white board to track the tasks and responses. Whatever you do, don’t let the fact that your staff is “too busy” to do a resale campaign be the reason you don’t get it done. 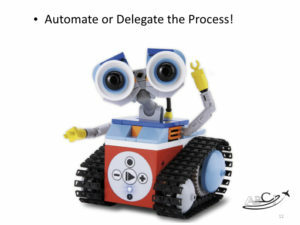 The process can be automated with software or delegated to temporary or outsourced staff. 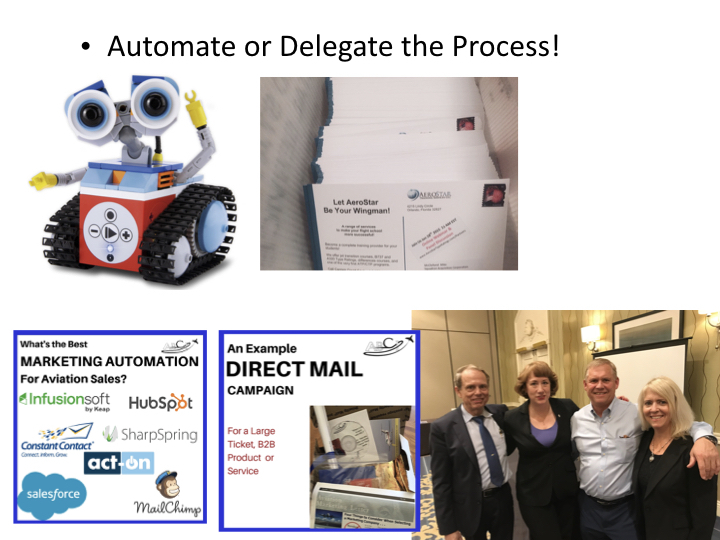 ABCI manages many of these campaigns for clients – generally speaking we collaborate on the materials, and once approved, we send electronic and postal materials on whatever schedule we’ve agreed upon. Of course, you’ll have to manage incoming calls and let us know (usually via the CRM) who’s responded. This lets you concentrate on discussing specific needs with your customers, closing those sales, delivering the best products and services to your customers, knowing that the details and heavy lifting of marketing is being managed. 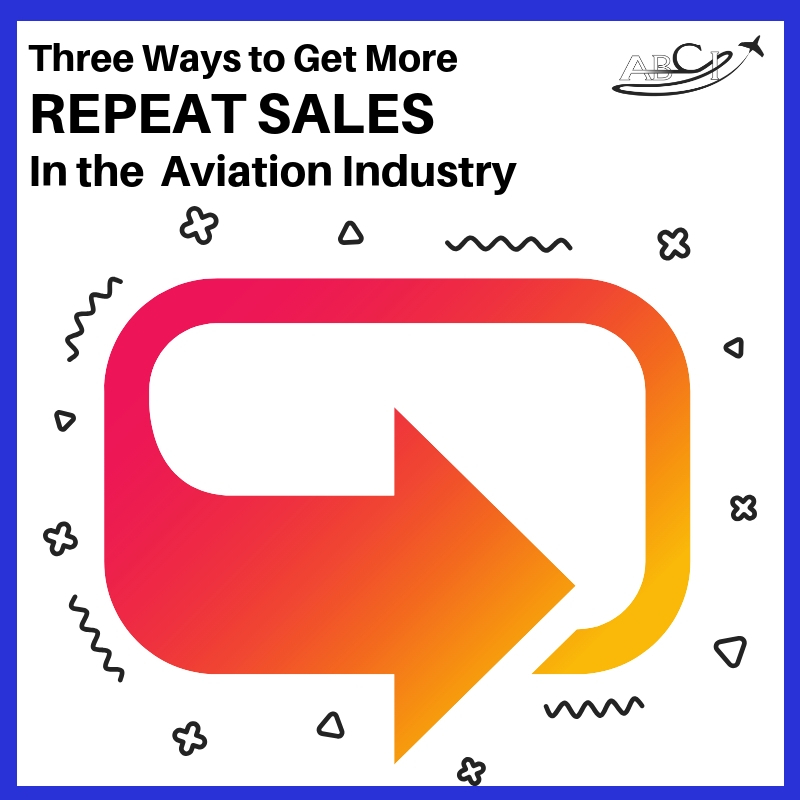 Whether you do the work yourself, or would like to have us handle part of it for you, we LOVE talking with aviation companies about how to get more sales. Schedule a free 30-minute consultation with us and let’s talk about how we can get a higher percentage of your customers to repeat purchases. Schedule a free consultation and let’s talk about how to get more repeat sales! Schedule a free 30-minute consultation or call Paula at 702-987-1679 us and let’s talk about how we can get a higher percentage of your customers to repeat purchases. 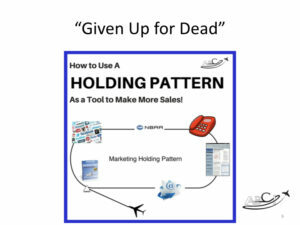 Most aviation sales professionals give up on prospects way too soon! In this episode, John and I talk about the difference, and how to revise the ones that can be revised. Are they qualified to make a purchase now? Are the things that are keeping them from purchasing anything within our control? If those factors are outside of our control, is it possible that they will change at some point in the future? Do we have permission to stay in touch with them? 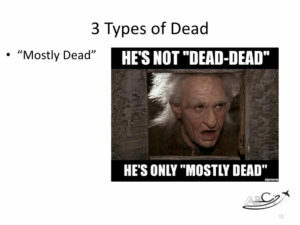 Why Do Salespeople Leave Prospects for Dead? 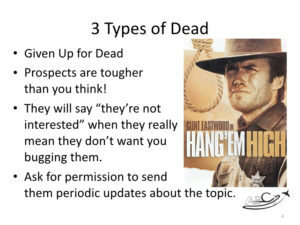 Prospects are tougher than you think! And they don’t die easily. Like Clint Eastwood’s character in the movie “Hang ‘Em High,” being “left for dead” is not a great thing. Many novice salespeople just check the box in their prospect file that says “Not interested,” close the file and move on. 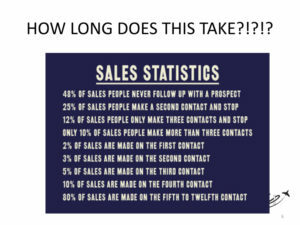 The problem with this is that these novice salespeople miss out on 80% of their sales! So, when your prospect tells you he’s not interested, what do you do? Ask for permission to keep in touch in a low-key way. Offer to send them your newsletters. Invite them to have coffee at an upcoming trade show just to talk about business. Then, add them to a “holding pattern.” Like a holding pattern at an airport, a holding pattern works best if it’s as planned and practiced as possible. If you have a CRM or email program, you can send regular updates, and use a tickler system to remind yourself to call this prospect or check in on a regular basis. Use any excuse you can think of to stay in touch in a non-salesy, low-pressure sort of way. Ideally, one that educates the customer about your products and services. A “tip of the week” with useful information goes a long way toward building a long-term relationship. If you’ve seen the movie “The Princess Bride,” you may remember the scene where Westley is almost killed. His friends, Iñego Montoya and Fezzik carried him to the home of Miracle Max. 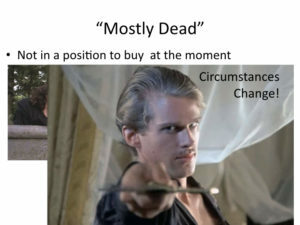 Miracle Max declared that Westley was not “actually dead,” he was only “mostly dead,” which means “partly alive!” Miracle Max and his wife administered a magical pill and said Westley would eventually revive. Inego and Fezzik bodily hauled Westley around for the rest of the movie until the climax. And, of course, Westley the unassuming farm boy saved the day and everyone lived happily ever after. 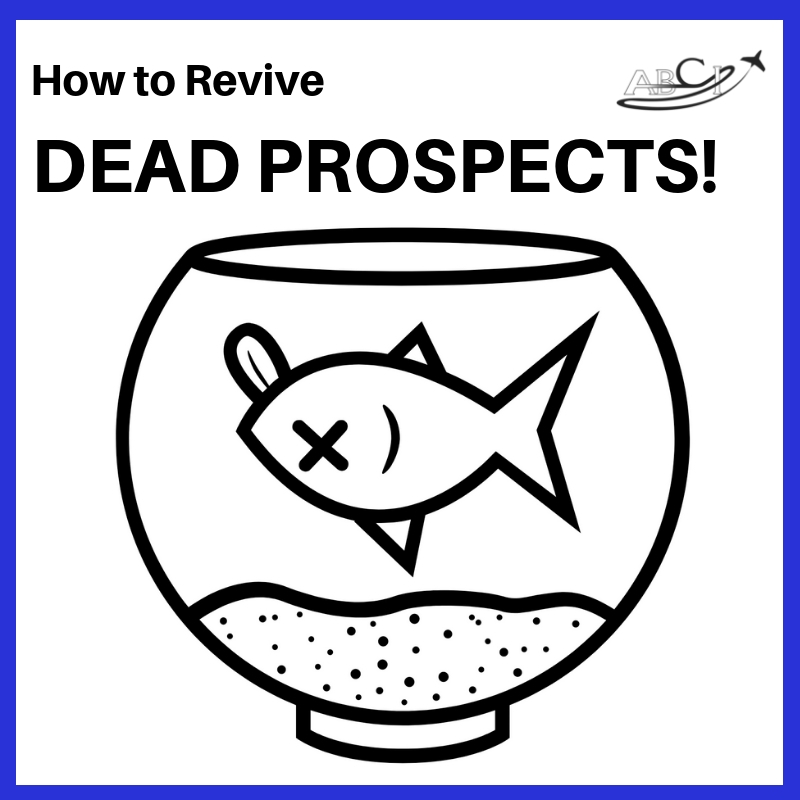 The moral of this story in our case is that sometimes you have to carry your “mostly dead” prospects around for a good length of time. And often then end up being your very best customers. 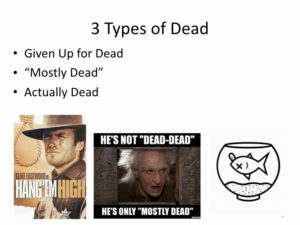 What if Your Prospect is Actually Dead? 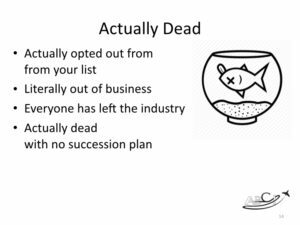 If someone has ACTUALLY opted out from your mailing list, is literally out of business, or has actually died, of course you can save yourself the time and postage. In fact, if someone asks you to stop sending emails, you’re legally required to stop. No problem. There are plenty of other fish in the sea! 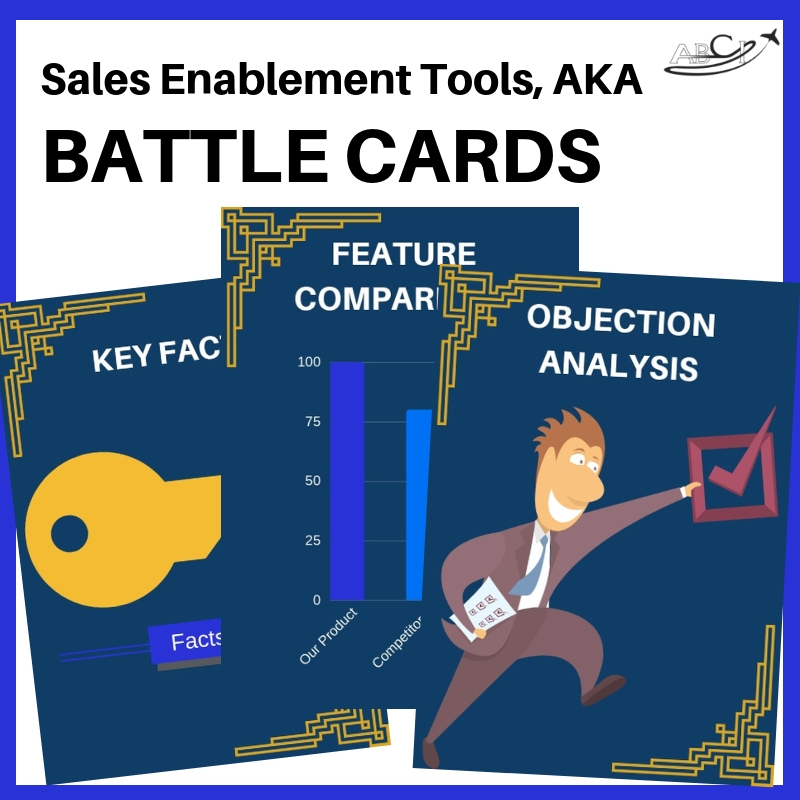 Sales Enablement Tools – AKA BattleCards! 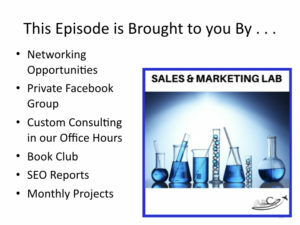 John and I talk about the pros and cons of Sales Enablement Tools, including a list of three that you MUST have in your wallet to win sales. Wow, what a great idea! And also, wow, what a terrible idea! 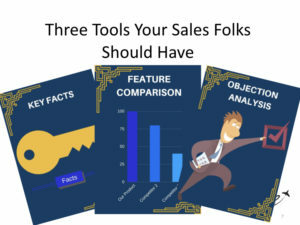 We’re all in favor of sales enablement tools, which are references your salespeople use to get up to speed and use key information about your company, products, services, customers and competitors. After all, the more information they have, the better they will do, right? Not so fast. 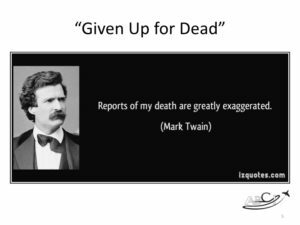 . .
Caveat – Sales is Not A Game! Sales is NOT a battle! You and the customer are ON THE SAME SIDE. Treating sales as a game could trivialize customer concerns or prevent careful listening. Many salespeople also suffer from an “us versus them” mentality, and this analogy might actually contribute to that problem. If you’ve ever watched kids playing with battle cards, they are slapping cards down as fast as they can do the calculations. No reference tool should ever be more important to the sales process than listening to, and truly understanding, the customer. This is one great reason that new salespeople tend to do really well. If they don’t know much about the product or service, they spend MORE time and energy working really hard on customer research and make no assumption about what they think they know. Create an easy reference sheet that includes the basics about the company, the primary products, the ideal customers, the main competitors, and the expectations customers have about what the brand can do for them. Many of your customers will be doing their own comparison about how your products stack up against the competition. You can do this work for them and lay it out in a simple matrix. Brainstorm the most common questions and objections your customers bring up in discussions, and spend some time writing out thoughtful answers. 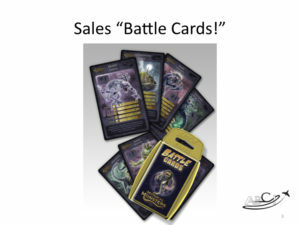 Building (regularly reviewing and updating) these three battle cards with your sales team is a great way to ensure everyone is up to speed on important facts, and that your team is consistent in the information they’re communicating to prospective customers. This is also a great vehicle to communicate changes. When you roll out a new product upgrade or acquire a new customer you can use as a reference, update and redistribute your Battle Cards and review them in your next sales meeting! Why are Credibility Markers important for aviation salespeople? Ideally, the world would be a perfect meritocracy and every decision would be made after carefully considering all relevant information. Unfortunately, customers may not know as much as they should about the products and services they’re researching. And they’re busy. So they may subconsciously use a “shorthand” for a first impression about how credible a person is, and how much weight they should place on his or her advice. 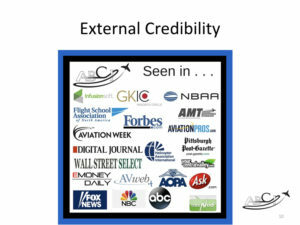 Many of the people who seek our help in aviation marketing and personal branding are concerned about credibility markers. They find that their competitors are being quoted in industry magazines, asked to speak at events, and most importantly, and are able to sell their products and services with a lot less resistance. In many cases, it is not because their competitor ACTUALLY has more authority, credibility and expertise, but because that person has more PERCEIVED authority, credibility and expertise. 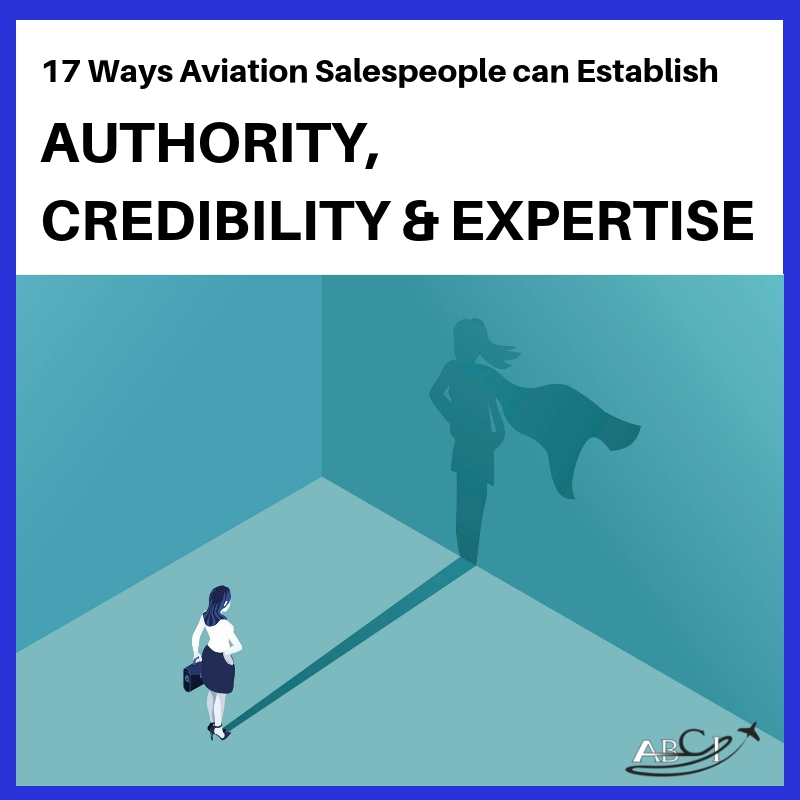 Here are a few of the things that aviation salespeople can do to be seen to have more authority, credibility and expertise. Give a Presentation or be a Guest Speaker or Panelist. Build a Social Media Audience. Be a guest on an aviation podcast. Make sure your website is clean, current & correct. Host a webinar, class or workshop on your topic. Publish a Buyer’s Guide, Checklist or Tip Sheet. Write the Five Key Stories Every Aviation Company Must Tell. Lions don’t need to roar. You’ve probably acquired some of these markers, but it’s also important to make sure people SEE them. The more visible your credibility markers are, the less you have to talk about them. For example, ensure your book is available from Amazon and has reviews from people who have read it, even if you serve a very small niche and are not likely to reach New York Times Bestseller status. Put a link to your book on Amazon (or your local bookseller, if you prefer) on your email signature line. We give away more books than we sell, but many people searching for “aviation marketing” or “aviation social media” on Amazon will find us through our book. You can put logos together from outlets that have published your press release and include it on your website, or incorporate them into a brochure that you send to prospects and customers as part of a new customer welcome package or an annual update package. You can include them in the footer of your website or newsletter. You can feature them on your social media profiles. The more visible you make your credibility markers, the less you have to talk about them. JetBrokers hung photos of each aircraft they sell in their office. (Until the frames were discontinued, and they ran out of wall space! ) Brokers like Jeremy Cox who use this office to chat with clients (or prospective clients) hardly need to mention the success record of the firm. 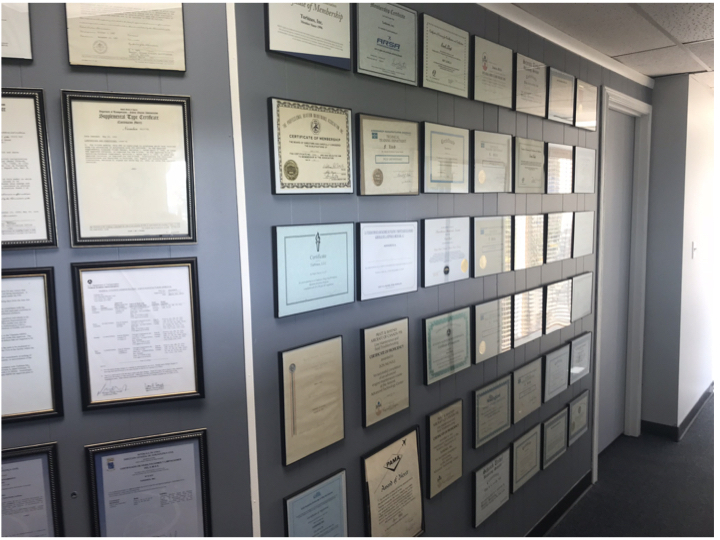 This hallway of credentials and award in Turbines Inc’s office in Terre Haute leaves little doubt about their qualifications as visitors enter. Make the Credibility Markers you have already accomplished more visible. Choose any three and make plans to accomplish them in the next 90 days. Make plans to accomplish ALL (or most) of them over the next three years. Closing aviation sales has become more difficult. Why? 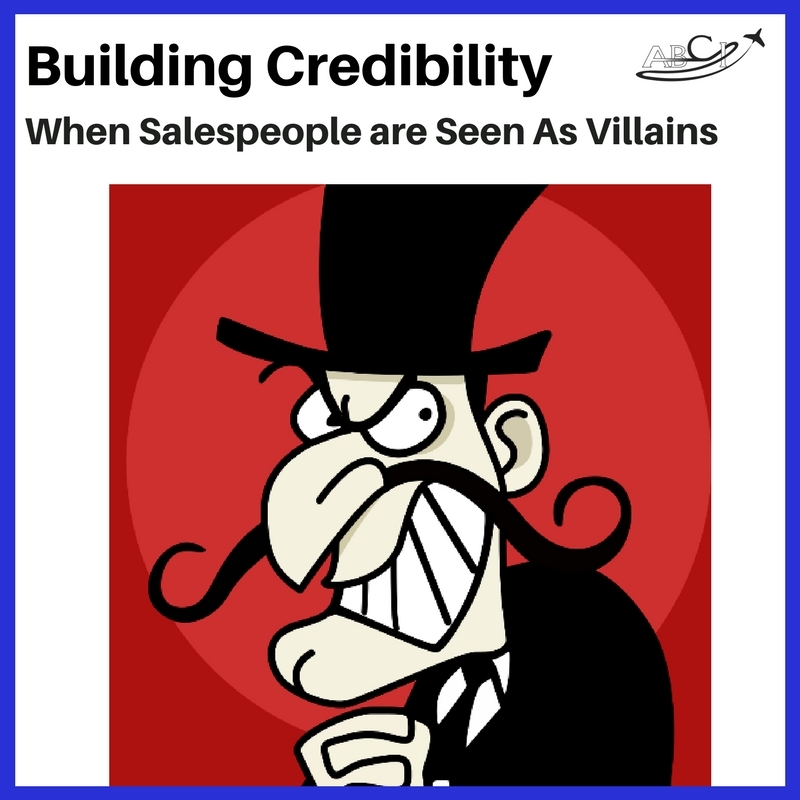 Because salespeople and marketing folks are increasingly seen as the “villain” in the story, until they prove otherwise. We share three techniques to get out of “villain mode,” build credibility, and close sales more smoothly and reliably, and with a lot less suspicion and friction in the process. 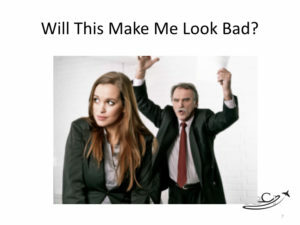 Prospects are often more afraid of disappointing their boss or coworkers with a bad decision than they are of spending money on an appropriate product or service. Why is it so hard to build credibility with aviation prospects? Because as sales or marketing professionals, we are “cast as the villain in the story” from the very beginning. It’s also very difficult to get the attention of busy, distracted prospects who are constantly barraged with advertising, most of which is of questionable relevance and value to them. 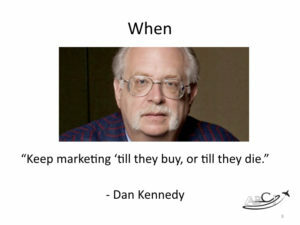 And once we do get their attention, it’s hard to progress the sales process. Even people who are offering free trials have a hard to “giving it away.” Why? While many beginning salespeople assume that sales resistance is about the money, in business to business sales, that’s usually not the biggest problem. It’s not really the prospect’s personal money we’re talking about. But their credibility is on the line, and they’re worried about looking bad to their boss, or causing a hassle for their co-workers by making a bad decision. 1) “Borrow” credibility by associating with people and entities your prospects trust. Even if they’ve never heard of your company, they’ve heard of NBAA, and Forbes magazine, and your local newspaper, and aviation celebrities. 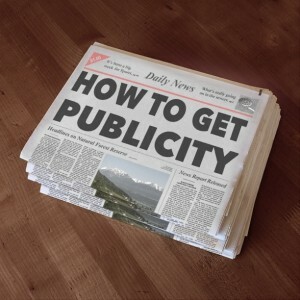 If you’re a member of an organization, have spoken at an event, been published in a magazine, or been endorsed by a celebrity, don’t keep it a secret! We like to produce a “racecar graphic” for our clients, that they can use on their website, brochures, email signature line, and other places. You’ve worked hard to build relationships and credibility – use them! 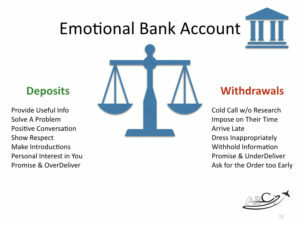 2) Invest in the Prospect’s Emotional Bank Account. Making sales is not just about making sales. Before you can gain someone’s trust, you need to build a positive “balance in their emotional bank account,” to borrow a term from Franklin Covey. Offer useful information. Make introductions. Keep promises. Overdeliver. Every “deposit” increases trust and credibility. Make introductions to people they will find interesting and/or helpful. Show a personal interest in the prospect, not just his wallet. Make promises, and deliver on them! Every “withdrawal” decreases trust and credibility. Start with a “cold call” – without having done any research. 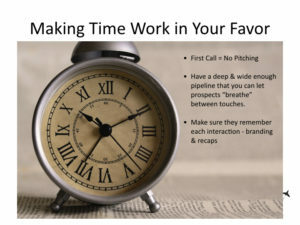 Arrive late to a meeting, or don’t call when you say you will. Withhold important information that he would find important. Make promises and break them, or under deliver. To make contact early in the process, and stay in touch over time. To keep a full pipeline so different prospects are “coming to fruition” at any given time. 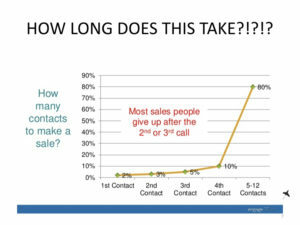 To ensure each contact is “branded” so they recognize the pattern of contact. We talk in more depth about strategies for closing aviation sales in our Aviation Sales Basics course! 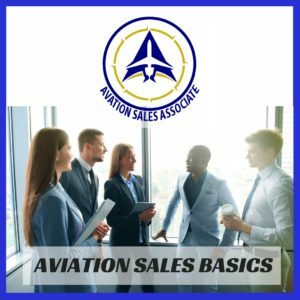 The course includes some systematic information that’s often missing from other sales training opportunities, AND opportunities to interact with some of the most skilled sales and marketing professionals in the aviation industry.